Preheat oven to 350°F. Spread the walnuts on a small baking sheet and roast for 5-8 minutes, tossing a couple times to ensure evening cooking. Set aside to cool. Remove the green hulls and slice the strawberries into ¼ inch slices. Place them in a small bowl and stir in the coconut sugar. Let stand for 5 minutes, stirring occasionally. In a small bowl, mix together the yogurt, honey and lime to make a dressing. When ready to assemble, spread the dressing over the wrap. 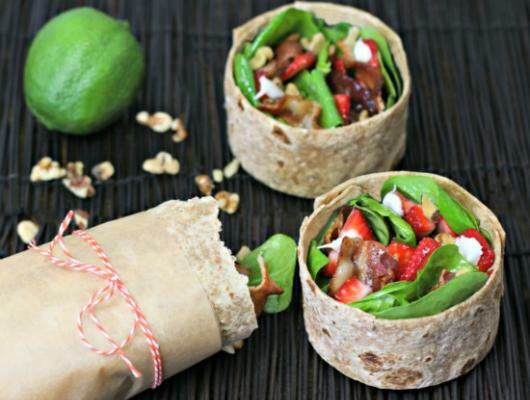 Top with the spinach, strawberries, bacon, walnuts and chia seeds. Roll up the wrap and cut in half. Enjoy IMMEDIATELY! 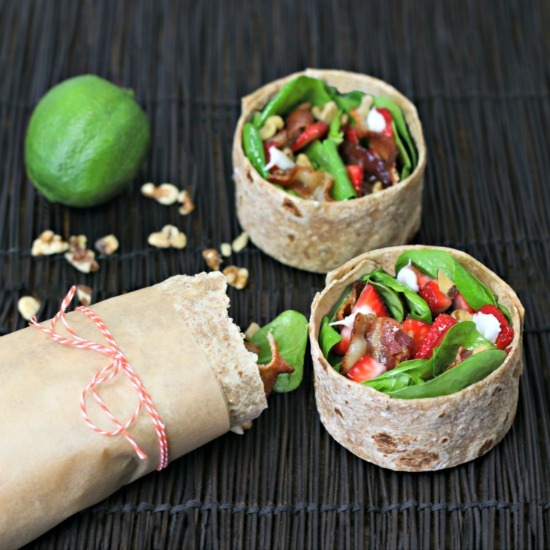 This Strawberry Spinach Breakfast Wrap is a yummy, quick, deliciously reFRESHing, packed full of nutrients morning meal. Perfect healthy alternative!